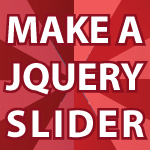 In this video tutorial I show you how to make a JQuery Slider similar to the ones Apple uses. This is the final component of my upcoming WordPress shopping cart theme. I use the JQuery UI slider as a base and then make it into a more useable tool for your websites. My custom JQuery slider code follows the video. The theme used is available here JQuery Theme Roller. Delighted to have found your tutorials, they’re appreciated! I love your tutorials man!,, your awesome! I’m just a beginning to learn jQuery and I learn a lot from watching your tutorials.. I’m so glad a watched your jQuery ui tutorials,, Thank you derek,,I hope to watch another jQuery ui tutorials from you… God bless! I just wanted to say thank you for all your work. I wonder if there is a tutorial how do you actually do all of your tutorials? It’s kind of funny because almost everything I use is free to download, or came free with my computer. I don’t have anything fancy except for my computer. That only cost me $1,000, but was a tax write off because I use it exclusively for work. If you want to know how to video blog like a pro (Not Like Me) checkout How to Video Blog. Thank you, I have read Become a YouTube Partner and it is very interesting article. I was hoping to find out what your technical setup is, like hardware (PC/MAC)and software you use. Just for people who would like to try to do screencasts like you. I have a Mac 27-inch 2009 model. I record everything with Quicktime Player. I edit everything with iMovie. I use Keynote for presentations. My 2 editors are Text Wrangler and Eclipse. I have an old Kodak Zi8 camera and my microphone is the $15 Apple headphone set you get for iPods. Everything for the most part is either free to download, or came for free with my computer. When I started out I used a $200 mac mini and it worked pretty good until I started doing more video editing. I eventually will upgrade my screen casting software to Screen flow and I’d love to buy Final Cut Pro X.
I’ve been using a jQuery slider called jcoverflip and I want to create div boxes that display an enlarged version of the image shown on the slider when double-clicked. So far I’ve been able to create a pop-up interface using the “onclick” tag. Any idea on how to make divs within the page that trigger to show the enlarged image when the slider is double-clicked? Your tutorials are very helpful. Came across them on youtube and I’ve been hooked ever since. Thank you 🙂 I plan on making tutorials on pretty much any topic for a long time. I really enjoy making them and I’m very happy that you like them! Thank you for all of your tutorials. They helped me a lot, a beginner. I am trying to make two sliders on top of each other showing two different categories. For the bottom slider I copied the codes and pasted underneath the codes for the top slider and changed the links to the images. The problem is that the images in the bottom slider move in sync with the ones in the top slider as I move the bar in the top slider, and vise versa as I move the bar in the bottom slider. I am not at the level to understand all the codes in detail yet. Any help will be appreciated. Solved it by using different class names for scroll-pane. The scroll bar won’t reach either end after resizing window in different sizes. I was caught up with something else. I sure will try it out. By the way, are there any wordpress plugins with pre-order functionality? I want to create a website like <a href="http://lucuma.com.ar/ . Also, is there a way i can edit the layout of the scroll bar? Thanks for the reply, I’m going to watch them right now!